TRAMS are now up and running through Oldham town centre, marking the end of years of disruption and the start of a bright future for the town. Excited passengers from Oldham and beyond braved wind, rain and sleet to board the Metrolink tram shortly after 5am recently to be part of the historic first journey. The opening of the new line includes four new stops in the town, Oldham Mumps, Oldham Central, Oldham King Street and Westwood, as trams zip along the roads towards Manchester or Rochdale. Several eager transport enthusiasts bought tickets and braved the cold pre-dawn start to be part of the momentous occasion, boarding the tram at various stations along the way. The tram followed the new route through each of the four new stops, including Westwood, Oldham King Street and Oldham Central, before arriving at Oldham Mumps just before 5.35am. It was a welcome end to the years of disruption, engineering work and line closures that the town has struggled through as the new service was installed along Union Street, through King Street and down the hill towards Westwood. One of the first passengers on the new line was Peter Crichton, a transport enthusiast from Grotton. Oldhamers weren’t the only ones ready and waiting for the opening of the new line. Paul Steane (56), from Altrincham also got up several hours early to take a ride before heading to work in Preston. After completing its trip through the town centre, the tram continued to Rochdale, arriving at 6am, before returning to Oldham Mumps at 6.18am to take the first set of commuters to Manchester. Metrolink driver Chris Allen (50) had the pleasure of driving the historic first tram on the new line and said it was a “very exciting experience”. Mr Allen, from Hazel Grove, Stockport, said: “I really enjoyed driving the tram along the new line. 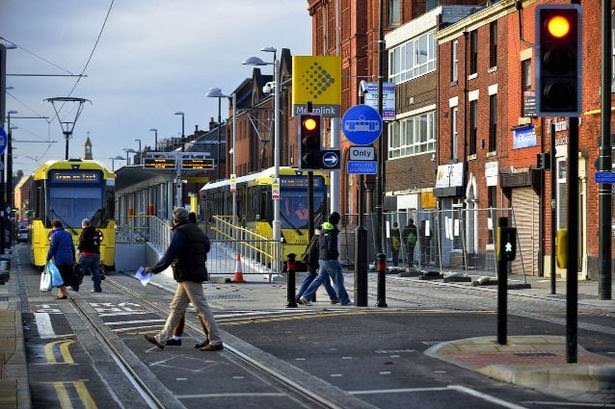 The town centre line, which stretches from East Didsbury, through Manchester and Oldham to Rochdale, is the latest addition to Metrolink’s network, bringing it to 48 miles and 76 stations. Journeys from Rochdale Manchester Victoria take around 45 minutes, while journeys from Oldham Mumps will take 30 minutes. A return off-peak adult ticket from Oldham Mumps to Victoria will cost £3.60 or £5.40 at peak times. Off-peak return tickets from Oldham Mumps to Rochdale cost £2.90 or £3.70 at peak times. The new Oldham Mumps stop also benefits from links to bus services and a free park and ride site for Metrolink passengers. Councillor Jim McMahon, Oldham Council Leader, said: “Today is a historic and exciting day in Oldham’s history – and one that points to a much brighter future. “We knew the biggest infrastructure project in our borough’s history would inevitably cause disruption, especially for businesses and motorists, and I want to thank people for the patience they’ve shown during the construction period. “Looking ahead, our wide-ranging regeneration plans for Oldham town centre – like the work currently underway to turn the Old Town Hall into a multi-screen cinema – are all designed to capitalise on the arrival of the tram and the fantastic new opportunities it offers to residents, investors, businesses and visitors. 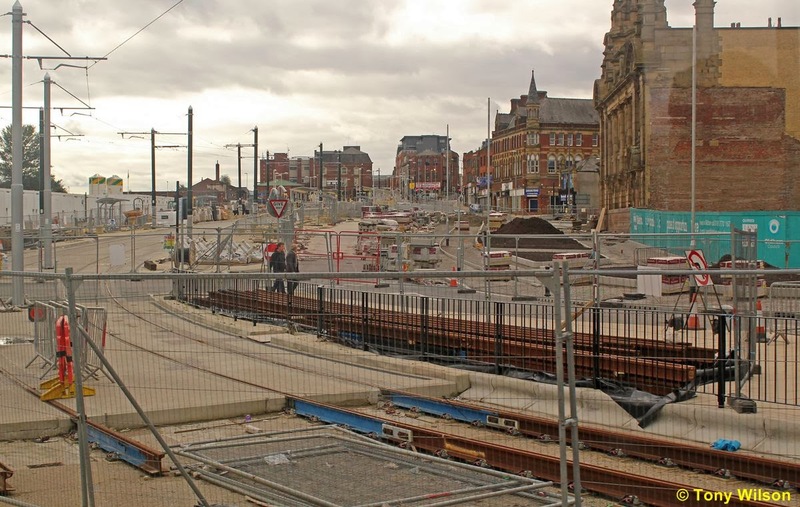 Nottingham is taking several steps closer to realising a £570 million modernisation of the city’s tram network at the start of 2014, as work gets underway on the final stretch 7.5-kilometre extension to Clifton. Two images of the tramworks in the city centre, a new bridge over the main Nottingham railway station (upper), and progress of the line away from the station (lower). Contractor Taylor Woodrow will begin installing track and constructing new stops on Southchurch Drive and Farnborough Road on February 2. 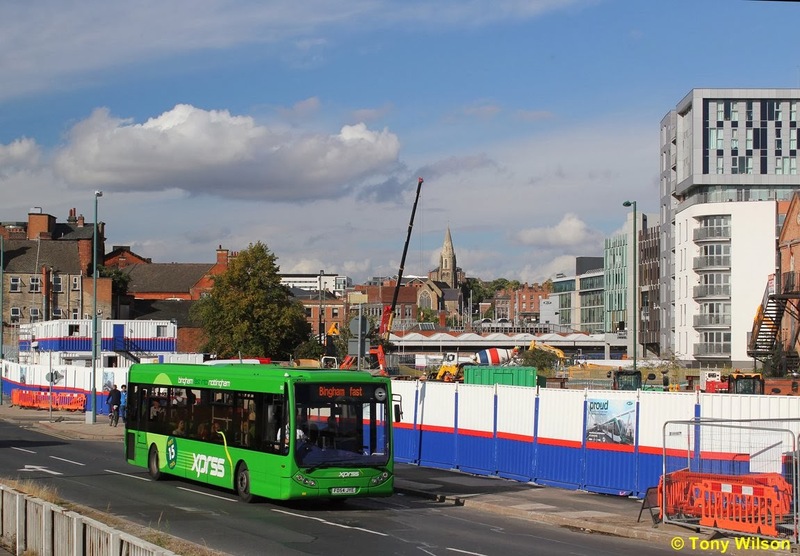 The works will complete one of two new lines being built to extend Nottingham’s tram system from the city centre south and south east to Clifton and Chilwell/Beeston. In the background one can observe the new bridge that will carry the tramway over the ring road just south of the Queen's Medical Centre and the University campus. In total, 17.5-kilometres of new track will have been installed by May this year. The new lines are part of a multi-million pound programme of improvements to Nottingham’s tram system, which also includes a fleet of 22 new Citadis trams from Alstom. Tram operator NET has also begun installing ticket machines and validators at the city’s tram stops. Although the new ticketing system will do away with the need for conductors on trams, NET has said members of staff affected will be redeployed across the network. Phil Hewitt, chief executive of NET concessionaire Tramlink Nottingham, said: “The new machines will be simple to use and the process will be quite straightforward. “Conductors will still be on trams for some weeks after the ticket machines are switched on as the new system beds in. “The role of conductor will then be replaced by a range of other customer facing staff who will be out and about on the network, checking tickets and helping people with travel queries.